Those gift-giving holidays are upon us, folks, and we've been nudging you in the "shop local" direction from the jump. You see, we live for making lists and checking them twice as much as the next guy, and if we can get goodies for all of our loved ones and benefit the community at the same time? Classic win/win scenario. And it's precisely why we get so hyped to tout the good word of the Art Adoption each time it comes 'round. 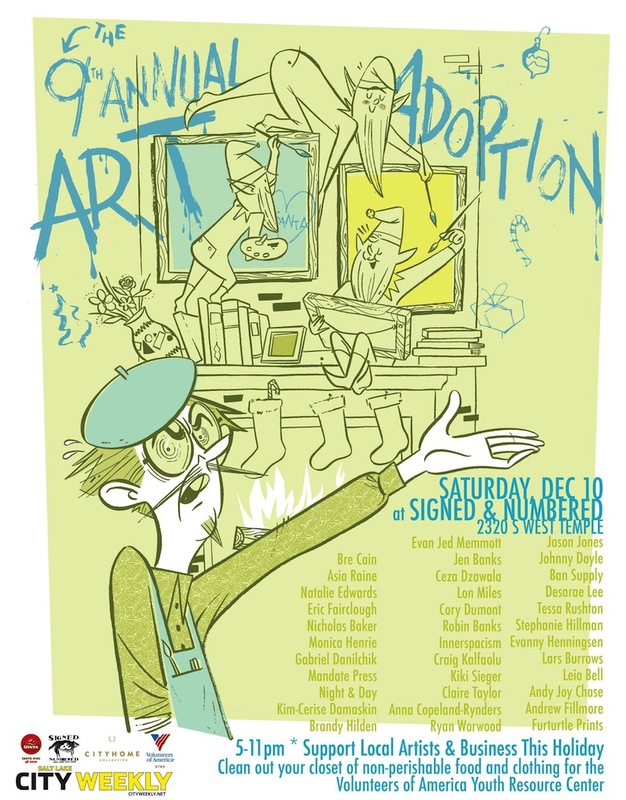 The bi-annual do-good gathering was started up by our COLLECTIVE pal (and all around saint of a guy) Josh Scheuerman, as a space for a few sensational local artists to sell their work, and as a place for folks to bring their clothing and food donation for Salt Lakers in need. (See what we mean about "saint of a guy"?) In short, "Art Adoption was created to offer artists a way to sell art, friends a spot to gather, and provide a way to give back to the community," and we'd say it's hitting all the marks flawlessly. The one-night extravaganza will include "everything from custom jewelry to hand-made pottery to high-end oils and prints," and with more than 30 local artists on display, it's one of the largest exhibits of its kind in SLC--and the perfect place to find your last-minute gifts. Come on down, have a drink, and peruse some amazing, local art (bonus karma if you bring some non-perishable food or clothing donations, which will go to Homeless Youth Resource Center). Yes, there's a lot of local good going on in these salty streets, and we think you'd be remiss to skip this big-hearted get-together. What's not to love here? Do your part and snag some art.